Since most states are reforming their state testing to the PARCC test, we need our students to practice and become familiar with the language and types of questions used on the PARCC. This pack was designed to meet that purpose and expose third grade students to the rigor and complexity of the PARCC assessment. 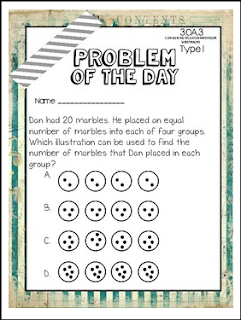 This pack will give a quick analysis of the types of questions found on the math PARCC assessment and gives ample practice problems for students to get used to the question format. I hope you find this product useful and informative! ***Attention: Since this product is a freebie, it only has some of the Common Core Standards represented. I choose random standards to be represented in this freebie. Please use this product as a way to test out the quality of my work. If you like what you see, please come back and check my other units for purchase. Please leave feedback too!